Step 1: Find out what people are passionate about *outside* of work. When my husband was a child, he couldn’t understand why his older brother would voluntarily go to Hebrew School. Worried he would face the same fate, he asked his mother if he would have to go at some point too. “When you want to know what it means to be Jewish, then I’ll send you to Hebrew School,” his mother told him. Great, my husband thought, all I have to do is never utter those words and I’m home free. His brother’s bar mitzvah: a huge, lavish party at an expensive hotel, with dancing, food, drinks, laughter, friends, family, and most importantly…TONS OF PRESENTS and MONEY. The next day, my husband, eight years old at the time, said to his mother, “I want to know what it means to be Jewish.” And off he went to Hebrew School for five years, at the end of which he got his party, his presents, and some cash. Cut to the present: He has not stepped foot inside a temple since. I offer this parable to illustrate the effect of extrinsic motivation in the workplace, that being that the offer of rewards — bonuses, raises — do not create employee engagement, retention, or loyalty. With our eye on the prize, we will work towards the reward dangling in front of us until we get it — we will do the bare minimum to get it — and then we will move on to greener pastures. This is in opposition to intrinsic motivation, which is inspiring someone from within, when an employee wants to do a good job out of a personal and professional sense of integrity. They want to do a good job for the company and for themselves because they find meaning in their work and that meaning gives them a sense of purpose in life. It is up to the individual to come to work desiring meaning in their work, but it is also up to the leader to inspire from within. Neuroscientist Patrick Haggard, at University College London, studied the effects of intentional action vs action that is performed because of directives. What he discovered is that intentional action creates a warped sense of time. If, for example, you have a button that makes a sound and you intentionally press that button to make the sound you will think the sound comes much quicker than it actually does (a phenomenon called “intentional binding”). This warped sense of time is absent from those who press the button because they’re told to; they have a clear sense of the time interval between the button being pressed and the sound created. This warped time factor can be neurally recorded and this “neural signature,” as Gopnik put it, is how neuroscientists determine whether an individual feels a sense of agency or not with their decisions. In their studies, whenever a subject was told to do something the intentional binding neural signature was absent. When a subject acted out of their own free will the intentional binding neural signature was present. To be clear, If we feel a sense of agency, the neural signature of not being aware of time intervals is present; if we don’t feel a sense of agency the neural signature is absent and we clearly remember the time intervals between action and the result of that action. The end result is that when the neural signature is absent the subject doesn’t feel as though the decision to, say, press the button was their own. It was an order given to them. And as such they don’t feel like it was they who did it. How does this affect meaning in the workplace? The more agency you give your employees the more they will feel that they themselves are doing the work, they are creating and assigning the value to their work, and this motivates them from within because they have a sense of free will. If their job solely consists of taking orders and doing what they are told they will feel a lack of agency, and this lack of agency will create a gap between themselves and the work being done. They will not feel invested, like their own mind was being used, like they are making their own decisions and creating meaningful work on their own. They will grow bored, feeling untapped. They will work to not be punished. They will work for the paycheck, and the paycheck only goes so far. You will create employees who feel no sense of loyalty and will not experience any guilt over leaving you high and dry should something better come along. You want to create an aligned, harmonious culture where the people are engaged and feel a sense of loyalty to the work. Find out what other interests / passions your people have. And then utilize them. This creates more meaning for their life and feeds back into the company by creating an aligned, sticky culture. Promote individuality so people feel like their specific existence plays a valued role in the organization/company. Promote psychological safety. Create a comfortable environment where speaking up is nurtured. Feeling safe to be vulnerable, to take risks, to just be can be powerfully motivating. Google conducted 200+ interviews over the course of 2 years looking at more than 250 attributes of 180+ active Google teams. They found the teams that had achieved psychological safety were the most successful. Create Supportive, Friendly Competition. Focus on how everyone’s individual efforts help the entire team achieve success. Remain alert for unwarranted complaints about others, angry outbursts, backstabbing, finger pointing, and sabotage. Create friendly competition, not an ultimate “win or lose” challenge among team members. Celebrate Success. Celebrating small wins motivates. It helps teams stay focused on what they are working for, and it gives everyone a chance to reflect on their successes. Take everyone out for drinks or create some time during the workday to acknowledge the wins. Show Appreciation. Feeling appreciated is a core emotional concern for all humans. It is part of our make-up. A simple thank you, a handwritten note, a pat on the back, or gratitude for someone’s unique contribution can be more motivating than money. If you want to give a token of appreciation, tailor it to the individual: show that you’ve been listening (e.g., a day at the spa, tickets to someone’s favorite band or restaurant that they keep talking about). This makes the gesture unforgettable. Pay attention to the environment. If you can, build a beautiful, cozy, fun, creative atmosphere for you and your people to work in. Research has shown that environment can be more important and more motivating than money. Our surroundings can inspire our brains. 7. Hire for cultural fit. You’re building a clan. It behooves you to hire with personality in mind, not just credentials. We spend most of our lives with our coworkers, it thus makes sense for these people to be our friends, people with whom we’d like to get a drink and spend time with outside of work. For proof of concept, look to Zappos. I recommend reading Tony Hsieh’s Delivering Happiness. 8. Be flexible. For instance, if a remote work situation produces good results from a valued employee, work out an arrangement that works for all parties. Saying no just because it’s never happened before is spiteful. If you can’t reward with money, maybe there are other things you can do to show appreciation — be creative! Think outside of the box. 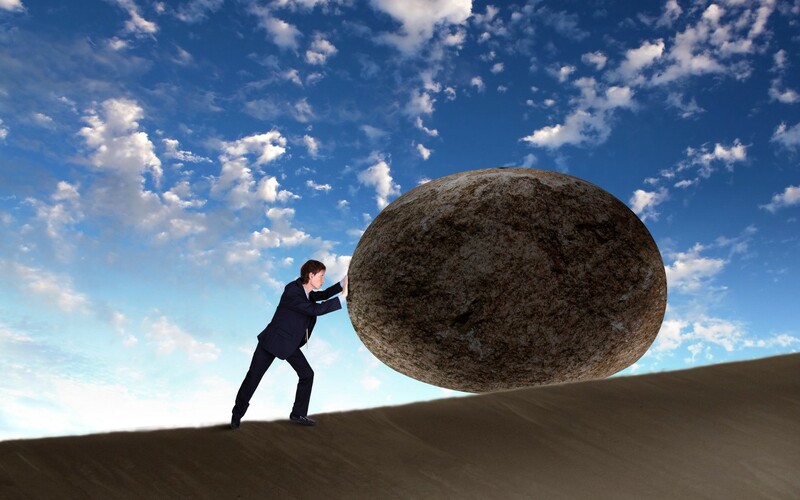 The tale of Sisyphus is oft-used as a metaphor for drudgery and drone office work. We can all potentially turn into — or feel like we are being turned into — Sisyphus, taking repetitive orders to complete mindless tasks ad nauseum. But we don’t have to live that way. Our work lives don’t have to be mindless, hopeless struggles. Leaders should play a major role in that pursuit: create meaning in the workplace to the best of your ability, acknowledge successes, and reward the struggle. I would love to hear about your own experiences with either experiencing or creating meaningful work and workplace cultures! Follow Nicole on Twitter, Facebook, LinkedIn, and Instagram. Sign up for my free newsletter here to receive insights about fueling leadership through neuroscience and psychology.